One of the dimensions of the point of inflection which has been occurring in the geospatial world over the last year or two is that spatial is becoming increasing less special. What this means in practice is that geospatial enabling is what most organizations are turning to as they include spatial data in their IT processes these days rather then traditional GIS. A very good example of this is what is happening in the world of network infrastructure, which in practical terms refers to the power, telecommunications, water, waste water, cable, and other public utilities that you rely every day. A rule of thumb for organizations responsible for maintaining network infrastructure is that maintenance represents 90% of the total cost of network infrastructure over its entire lifecycle from planning, through design and construction, operation and maintenance, to decommissioning. An essential requirement for ensuring profitability is managing maintenance costs. An important tool for managing costs is a digital model of network infrastructure. Most of the world’s network facilities data has been and continues to be captured using CAD-based desktop applications. For example, it is estimated that there are billions of CAD drawings files worldwide and the chief reason is that in most organizations the business process for building new network infrastructure relies on CAD to create the original engineering design. Another reason is that that virtually all conversion vendors, the folks that convert paper to digital data, use CAD desktop tools for capturing network infrastructure data from paper-based construction drawings. The business process by which network facilities data is captured and managed is comprised of several steps. Engineering uses CAD-based tools to create construction drawings. Construction drawings are almost invariably paper drawings used by Construction in the field to build facilities. Construction drawings are returned from Construction to Records as paper as-builts which are captured into a geospatial datastore, which in the past was a traditional GIS and which is the permanent database of record for network facilities. This information is then used by Records to provide facilities maps, reports, and data to Sales, Marketing, Operations, Trouble Call, One-Call, regulatory agencies, and other internal and external consumers of network infrastructure data. 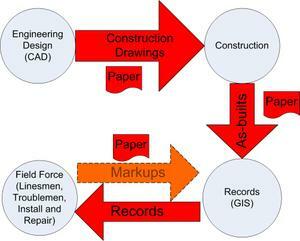 In most utilities and telecommunications firms, infrastructure data management processes are characterized by islands of information, Engineering (CAD), Records or Network Documentation (GIS), Construction, and Operations use their own specialized applications which are linked by paper-based information flows. These processes are inefficient, slow, unresponsive, and expensive. Significant improvements in quality of service and reduction in cost are feasible by breaking down these silos of information to streamline the flow of information by leveraging the original CAD data throughout the infrastructure management lifecycle. Inaccurate and out-of-date data is expensive. It means missed business opportunities, loss of productivity, and higher costs. Data quality in many utilities and telecommunications firms is poor and is an important factor in increasing for example the “cost per access line”, an important metric monitored by telecommunications firms. There is a direct relationship between poor data quality and a high rate of returns or repeats. Repeats refer to service requests that require more than visit. In many utilities and telecommunications firms repeats comprise 25-30% of service requests. A key requirement for managing network infrastructure efficiently and reducing maintenance costs is an intelligent, model-based database of the network facilities which represents a single point of truth accessible across the organization. The data model of an intelligent facilities database includes location, class or type of equipment, properties, and relationships to other facilities for every element of plant in the network. The route from a paper drawing to an intelligent infrastructure management system involves several steps, and can be perhaps most easily understood in terms of a CAD/Geospatial value chain. The original record of network infrastructure in most utilities and telecommunications is paper drawings. A large telecommunications firm will have millions of paper drawings. The next step toward automating infrastructure data management is CAD, which revolutionized the creation of construction drawings. Traditonally CAD was focussed on producing paper construction drawings. To enable the preparation of maps on a geographic landbase, geospatial capabilities were added to desktop CAD applications, such as geographic coordinate systems, so that the location of facilities could be placed on the earth's surface. The next major step forward in automating the management of network infrastructure involved the concept of class. Class refers to type of equipment. For example, in a power network pieces of network plant can be classified as primary conductors, secondary conductors, transformers, fuses, and switches. Each class of object typically has a set of properties which describe each object, such as input voltage, output voltage, manufacturer, year installed, etc. One of the most important advances in IT in recent years has been the extension of relational database management systems (RDBMS) to include spatial data types and spatial indexes. 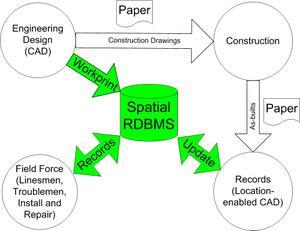 Virtually all of the widely-used RDBMSs in use today are spatially-enabled. These include Oracle, PostGIS/PostgreSQL, MySQL, Informix, and DB2. An important advantage of storing spatial data in a spatially-enabled RDBMS is that it provides open, standards-based access based on SQL, ODBC, and JDBC. All of the major geospatial vendors support one or more spatially-enabled RDBMSs. The final stage in creating an intelligent database and infrastructure management system involves support for relationships and constraints. Relationships include connectivity relationships, such as connecting a primary conductor to a transformer. Other types of relationships include those between structural elements such as poles or manholes and equipment that actually carries electricity such as primary and secondary conductors and transformers. Relationships are important because they enable traces, for example in the case of a power network, a downstream trace to identify customers affected by a disabled transformer, or an upstream trace to identify the sub-station feeding the transformer. Constraints are essential for data quality and prevent the user from entering bogus data. Typical constraints are property constraints, for example, restricting voltages to those supported by the network, or restricting the year of installation to between 1950 and 2007. Another important type of constraint restricts relationships between classes of objects. For example, a primary conductor can be connected to a transformer or another primary conductor, but not to a river. Another example is requiring that a transformer has a single primary input and a single secondary output. 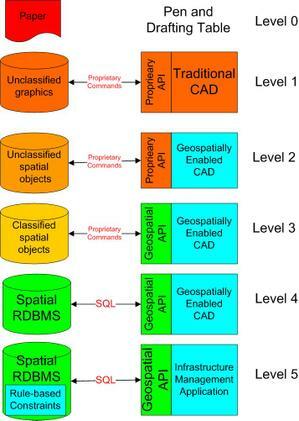 Geospatial enabling means that now the basic tools you need are a location-enabled CAD desktop, a geospatially-enabled RDBMS, an application for enforcing constraints, managing metadata including stylization, and enabling traces, and a web mapping tool. It is no longer necessary to implement a traditional GIS. This approach simplifies and reduces the cost of the implementation, especially for engineering focused organizations familiar with CAD tools and wanting to avoid the cost of implementing a traditional GIS. 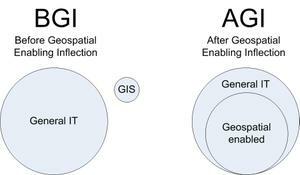 You said: "It is no longer necessary to implement a traditional GIS." However... I think that quite a few organisations benefit the advanced analytical capabilities in desktop GIS. In the hands of a GIS professional, GIS can perform a unique data mining and presentation role that simply can not be met by current web applications or traditional RDBMS. Appropriate use of desktop GIS can still be a differentiator. That said, it likely won't be a long time before improvements in the capabilities and processing power of web-based GIS and spatial RDBMS narrow this gap and make desktop GIS more of a specialty tool than it already is. The article from the site!